Marian (January 25, 1927 – November 20, 2014) and Vivian Brown (January 25, 1927 – January 9, 2013) were American identical twins and celebrity icons of San Francisco. Known as the San Francisco Twins, they were renowned for their appearance in media with adorning signature identically bright snappy outfits and hats atop meticulously coiffed hair. At 5 feet 1 inch, and weighing just 45kg each, Marian and Vivian Brown were always seen together. They dressed alike, walked in lockstep and ate at the same speed, even lifted their forks in unison. 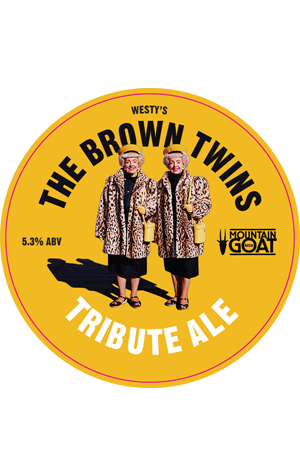 When he heard of the death of Marian this year, Westy decided on this, a tribute ale in their honour. The beer chosen for such a tribute is an American Brown Ale, albeit one that's more restrained than one might expect. The brewer describes the aroma as "malty, toast, biscuity, with subtle spicy hopping", the flavour as "clean and mellow ... one for the front porch rocking chair", ideally with your twin or, at the very least, a good mate.